Adaptive websites is one of the latest trends in the web design realm. Learn how adaptive design can help you to increase the website’s attendance. Adaptive sites is one of the latest trends in the web design realm. If you still did not switch over the adaptive design, you lose the great number of potential customers. The authors of the site for web designers called «Web Design Ledger» explained how the adaptive pagination can help to increase the site’s attendance. Many of your real (and potential) visitors come to your site from mobile devices. 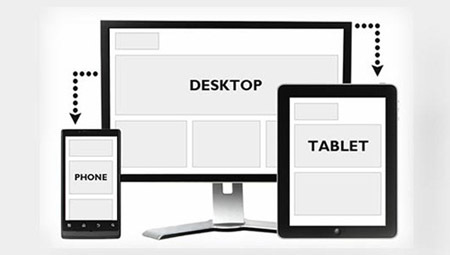 Adaptive design automatically adjusts to different display sizes. If your site does not support this function than the visitors face such weaknesses as distorted images, too small or on the contrary too large font size, content’s displacement. Very often the pages simply do not fit into the screen, and a user sees only not very large window’s part. Whichever qualitative content you offer, the visitors will hardly stay long on such website. containing adaptive design are screened equally well on different devices, and this thing provides the maximum comfort for the visitors and attracts a great number of visitors and even can increase the conversion factor! Each company strives for getting as much as possible part of target audience. With adaptive design you will attract the new segment of buyers who actively apply mobile devices. One more advantage of adaptive sites consists in the thing that they are loved by Google and other search systems. Adaptive web design can increase your positions in search results. This will not only increase the site’s visibility, but also will attract new visitors. If you still use the outdated design, then you not only lose the real customers, but blow a chance to attract new. Adaptive design will make your site attractive, will help to leave in trend and get more visitors. Adaptive pagination of the website is more than visual representation of your company and brand. It should be equally good screened on all devices that are applied by your potential customers including laptops, mobile phones and tablets.